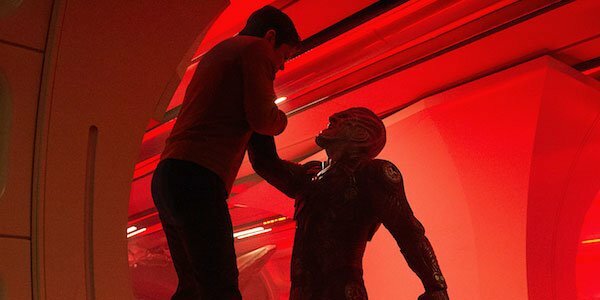 Paramonunt dropped the first footage that we’ve seen from Star Trek Beyond since the blockbuster dropped its teaser trailer in December, which didn’t really get a great reception. Given the short timeframe in which the movie is being made, it makes sense that footage was just an edit of the stuff that was available – and given the backlash, it makes a degree of sense they would wait to reveal more. But that wait is obviously now over. A direct sequel to J.J. Abrams’ Star Trek and Star Trek Into Darkness, the new Star Trek Beyond finds the Enterprise heading off on their famous five year mission around the galaxy. Key members wind up being stranded on a hostile planet, with a key new foe introduced in the Federation-hating Krall, played by Idris Elba. All of the key members of the franchise are back for the new installment, including Chris Pine, Zachary Quinto, Zoe Saldana, John Cho, Anton Yelchin, Karl Urban, and Simon Pegg (who also co-wrote the script). Right from the beginning, the more "epic" scope of the new Star Trek Beyond trailer is set, thanks to some ominous music and even more shadowy dialogue. The rigors of the crew's five year mission are starting to take their toll, as Chris Pine's Captain Kirk seems to be in a self-reflective mood about just what's driven him into the administrative arms of Starfleet Command. This is a far cry from the Beastie Boys drenched first trailer that seemed to have split the fandom in two, and if anything the second trailer seems to be aiming for an apologetic note towards the wronged. Of course, apologizing for the more easy going first trailer doesn't stop a fun joke from capping off the proceedings entirely. Thanks to the Star Trek Beyond fan event that was held in Los Angeles, we should have more Star Trek related news coming your way soon, so be sure to stay tuned! And get ready for the new space adventure to arrive in theaters on July 22nd.